More people are opting to grow flowers, vegetables and herbs hydroponically which is basically without soil. For ages, plants have been planted in the soil but here is a surprising fact; the soil isn’t a necessity for plants growth. As long as you provide the plants with the necessary nutrients, they will grow without soil. There are more than a thousand hydroponic nutrients brands available in the market today, at times deciding on what is the best hydroponic nutrients worth purchasing can be overwhelming. In this post we have reviewed 8 of the best hydroponic nutrients today, all that is required of you is to read through and make figure out what suits you best. The term hydroponics is derived from two Greek words hydro meaning water and ponic meaning plants. A hydroponic system is a system where plants are grown without soil. Where will the plants get nutrients from? That’s where hydroponic nutrients come in. So, what are hydroponic nutrients? These are commercially made plants nutrients specifically for plants grown without soil. Easy to provide nutrients- when plants are grown in soil, the nutrients can be leached beyond the reach of the plant roots. This means that the plants will be starved of nutrients. The same case cannot be said about a hydroponic system. The nutrients are provided directly to the plant roots. Can be used indoors and outdoors- the popularity of indoor farming has increased over the years. The hydroponic system can be used both indoors and outdoors which is an added advantage. It is economical- we are living in hard times. Any opportunity we get to save on a few dollars we should take it. Using a hydroponic system is economical in the sense that plants are grown in a controlled area and there is less need for pesticides. Saves time- plants grow in a controlled area are easy to monitor. Growing plants through a hydroponic system help save time in the sense that it is easy to monitor the plants. Some brands have everything mixed for you. All you need to do is add water to dissolve the nutrients then administer to your plants. Given that hydroponic is a relatively know tech and most people are not well conversant with it, as a beginner it is recommended that you choose a brand that is easy to use. Hydroponic nutrients are available in two forms that are liquid and dry powder. For a beginner, liquid form is the most recommended choice given the fact that it’s easy to use. However, it’s more expensive than dry powder hydroponic nutrients. Powder hydroponic nutrients, on the other hand, require some skills to mix but are considered economical and suitable for large plantations. Powder hydroponic nutrients are also fit to use in greenhouses. The best and most recommended farm practice is organic farming. There are both organic and synthetic hydroponic nutrients with each having its own set of advantages and disadvantages. The best organic hydroponic nutrients are chemical free meaning that these chemicals won’t end up to your plants and cause serious health complications. The only drawback with organic hydroponic nutrients is that they leave a foul smell and have low solubility. On the other hand, synthetic nutrients contain chemicals some of which can be toxic. Synthetic hydroponic nutrients are highly soluble in water and relatively affordable. Different plants require different nutrients at different stages of growth. To ensure that you only purchase what will be best for your plants go check on the nutrients content on the product label. Before then you should have researched on the nutrient requirement of the plants that you are growing. This is easy since all this information is available online or you can consult a specialist just to be sure. For plants to yield more they must get all the nutrients they require. PH is also a key factor when it comes to plants. Some plants thrive in slightly acidic conditions whereas most do well in a neutral to base PH. The PH levels of the nutrient solution should be indicated on the product label. Check to see if it suits your plants. You can’t purchase what you can’t afford and expensive doesn’t always guarantee high quality. In our review, we have mixed up things by reviewing both the expensive and affordable hydroponic nutrients to cater for the various spending capabilities. There is no recommended price tag you should be on the lookout for. Just review the features and determine what’s best for you based on what you can afford. General Hydroponics Flora Grow, Bloom, Micro-Combo Fertilizers takes the top stop in our review and this is a spot well deserved. The pack contains complete primary, secondary and micro-nutrients meant to enhance better yields and overall quality of crops. 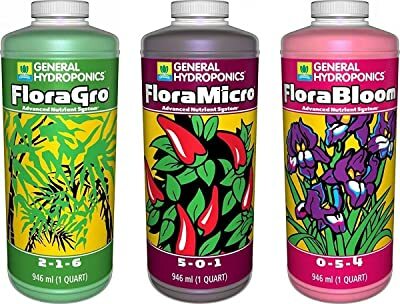 Coming from a reputable company that has supplied hydroponics for decades, General Hydroponics Flora Grow, Bloom, Micro-Combo Fertilizer is the best pick suitable for all plants at all growth stage. It comes in a pack of three that is grow, bloom and micro to cater for the various plants' needs over the various growth stages. Containing a special set of nutrients essential in stimulating vegetative growth and development of roots, General Hydroponics Flora Grow, Bloom and Micro-Combo Fertilizers is a darling to both the beginners and the experienced. When it comes to hydroponic nutrients solubility has always been an issue with most brands struggling to make the nutrients dissolve in water. This is not the case with GH Flora series. Its nutrients are highly purified making them dissolve easily in water. You can use each bottle separately given the stage of growth of your plants put for better results it is advisable that you mix them. The mixture is suitable for both soil and hydroponics farming. 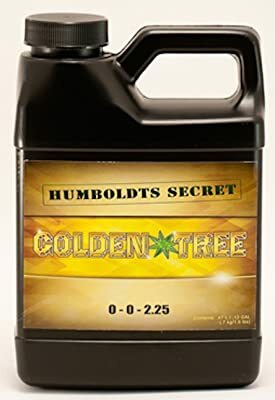 For hydroponic nutrients suitable for both trees and plants then you should consider purchasing the Humboldts Secret Golden Tree. With only a quarter of a gallon, you can more than 500 gallons of usable solutions to feed your plants. These particular set of nutrients helps in increasing the leafy part of the plants and given the fact that most plants make food through the leave, this means that there will be an increase in yields. Humboldts Secret Golden Tree is available in two packs namely base A and base B. This is meant to cater to the different nutrition needs of plants in different growth stages. This is one among the few nutrients that are capable of giving back life to a drying plant. The mixture can be used on trees, fruits, lawns, tomatoes, trees and vegetables that are either grown on the soil or through hydroponics. Depending on the condition of the plants Humboldts Secret Golden Tree should be used 1-3 times every week. Least assured that the product will help reduce vegetative time. Is an additive rather than a complete pack of nutrients! If you want strong roots developed fast then you should consider purchasing Superthrive V130155 Plant Vitamin Solution. It is affordable and focuses more on roots development. The vitamin solution is non-toxic and easy to administer to plants. The PH level is ideal for just any plant and can be used in both soil and hydroponic system. 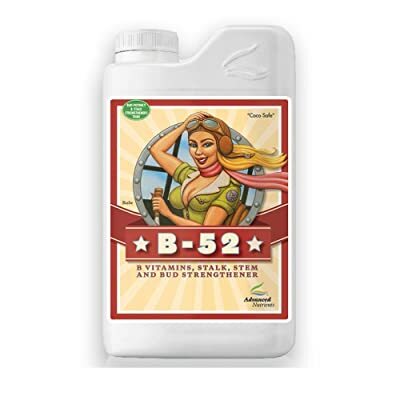 Only a few brands if any can match the B-52 Advanced Nutrients Booster Fertilizer ability to provide plants with naturally occurring hormones and vitamins to help boost the uptake of minerals, nutrients, and water through the roots. 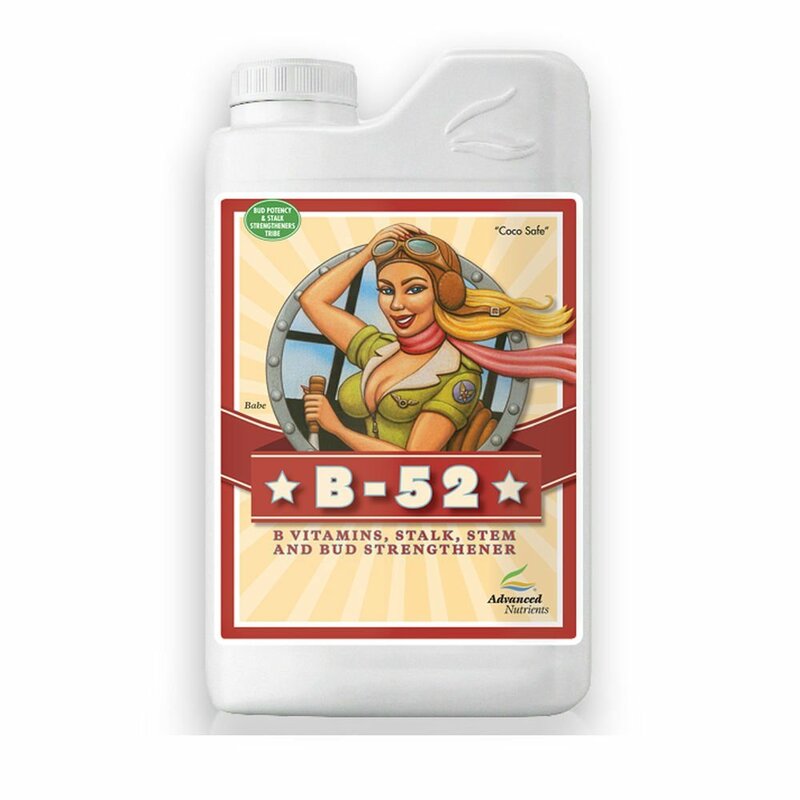 Whether your plants still germinating or about to be harvested, the B-52 is suitable for plants in all growth stages. It contains a special set of nutrients that help strengthen the roots making the brand an ideal candidate for both small and big plants. B52 Booster Fertilizer is largely organic. This is an added advantage in the sense that you don’t have to worry about the solution getting toxic. Hence, it can be used in all types of plants including seedlings. Flowering is an essential stage in the cycle of plants growth. 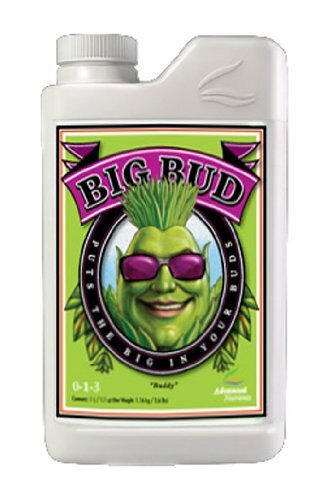 The complete pack nutrients for plants purchase the Big Bud Advanced Nutrients Liquid Fertilizer. The brand contains special nutrients that help boost flowering and formation of big buds. It also gives good flavor and aroma to your fruits only if used when the plants are flowering. If you are a fun of powder form nutrients then the best hydroponic nutrients worth purchasing should be the General Hydroponics MaxiGro for Gardening. This is a complete pack of primary, secondary and micro-nutrients making it effective in virtually all types of plants. 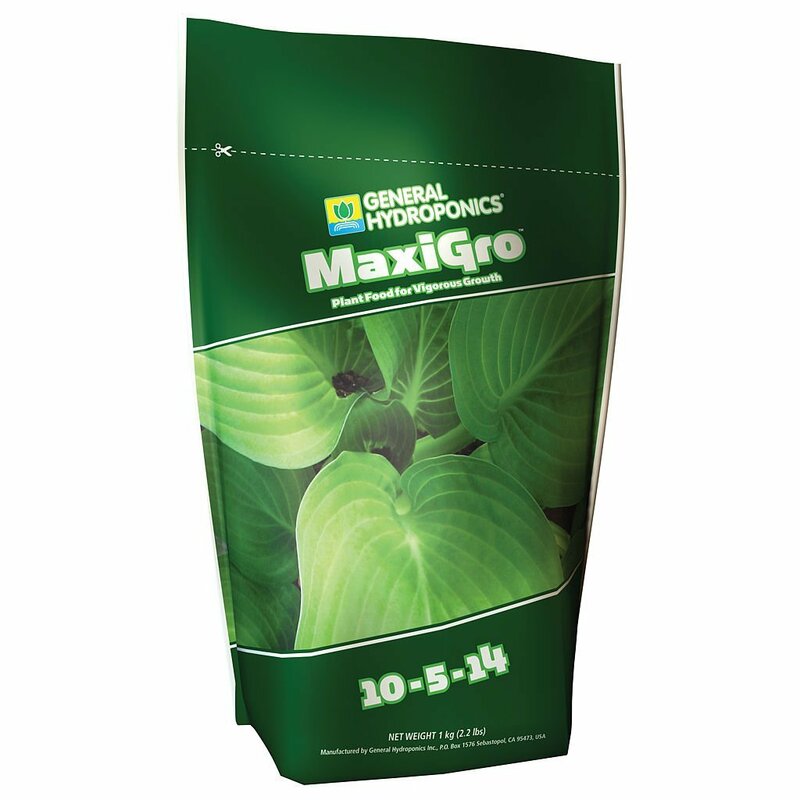 General Hydroponics powder form is available in two packs the MaxiGro and MaxiBloo. You can use the MaxiGro throughout the entire growth phases but it is recommended that you combine the two for better results. It is suitable to use from germination to harvesting. FoxFarm is a company that has been producing hydroponics for decades. FoxFarm FX14050 Trio Hydro-formula comes in 3 packs that are the big bloom, grow big and tiger bloom. Each pack has a clear set of instruction on how to mix the solution. Grow big pack is ideal for germination and vegetative phase. The set of nutrients present are meant to stimulate the growth of leaves and it is also ideal to use on seedlings grown on the soil or hydroponically. 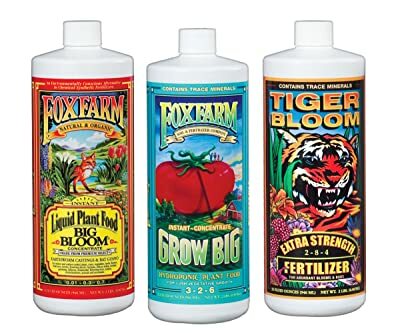 Tiger Boom pack helps in flowering and budding of the plants. Last but not least; big bloom is ideal for all growth stages. You can use this pack from the seedling phase to harvesting. 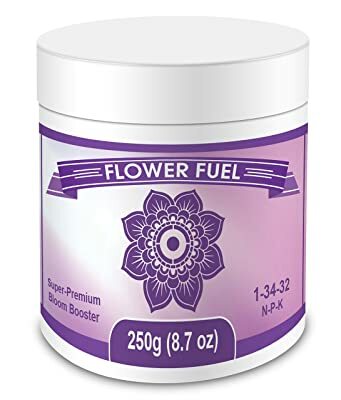 For a complete pack of vitamins, nutrients and amino acids then you should consider purchasing the Flower Fuel 1-34-32 250g Bloom Booster. It would have been unfair not to include this brand in our review of the best hydroponic system. Flower Fuel 1-34-32 250g Bloom Booster is the brand to guarantee you the dense and heavy harvests. It is highly soluble and specifically designed for hydroponic farming. Though highly recommended for the flowering phase it is ideal to use throughout the plant growth cycle. Nitrogen is essential for the growth and development of leaves. It is nitrogen that helps in the formation of the green pigments responsible for carrying out photosynthesis. A deficiency in nitrogen will hinder the vegetative growth of plants even worse make the leaves turn yellow. For the development of healthy stems, roots, and flowers, your plants need phosphorus on large in large quantities. Sufficient supply of phosphorus ensures both quality and quantity buds/flowers. This nutrient is essential for the overall growth of plants and in particular, synthesis of proteins. Hydroponic nutrients are supposed to increase the yields of your plants. But, you must first learn how to do it right. As mentioned earlier hydroponics is the science of growing plants without soil. Nutrients and minerals have to be dissolved in water for them to be availed to the plants. Always ensure that you follow the instruction on the product label. The concentration should be as recommended. Too much of it might make the solution acidic and this will damage your plants. The recommended percentage of the three macronutrients that is Nitrogen, Potassium and Phosphorous is 15%, 30%, and 30% respectively. It is my hope that you found this post on the best hydroponic nutrients useful. Without being pointed in the right direction deciding on what to buy can be an overwhelming task. In this post, however, we have reviewed 8 of the best. It is up to you to decide what suits you best. Show some love by sharing this post with a friend or two. Thank you! The pack contains complete primary, secondary and micro-nutrients meant to enhance better yields and overall quality of crops. It comes in a pack of three that is grow, bloom and micro to cater for the various plants’ needs over the various growth stages. Containing a special set of nutrients essential in stimulating vegetative growth and development of roots, General Hydroponics Flora Grow, Bloom and Micro-Combo Fertilizers is a darling to both the beginners and the experienced.